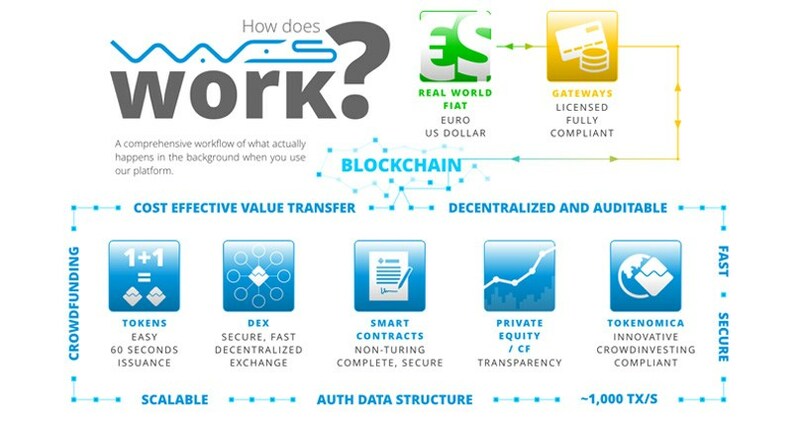 https://wavesplatform.com/ is one of my favorite crypto platforms, it bills itself as “Blockchain for the people” and it provides a number of interesting features, I personally hold Waves and believe it has a great future ahead of itself. Waves allows anyone to create their own tokens on the platform in a couple of clicks, it really is very easy to create your own crypto token on the platform. It also has it’s own decentralized exchange ( DEX ) which allows you to trade any of the tokens created on the platform, along with other currencies such as Bitcoin and Ethereum. Unlike currencies such as Bitcoin and Ethereum which rely on Proof of Work via mining , Waves uses something called Leased Proof-of-Stake which allows Waves token holders to lease their Waves to secure the network and earn rewards for doing so. The good thing about this method is you can hold your Waves tokens securely in your wallet, lease them out and collect rewards for doing so – you can lease your Waves to a staking pool which will pay you out rewards weekly or monthly in the form of more Waves and Miners Rewards – you can exchange the miners rewards on the DEX for more Waves or other tokens and currencies. In this guide we will walk you through how to setup your Waves wallet and begin leasing your Waves to earn extra income. 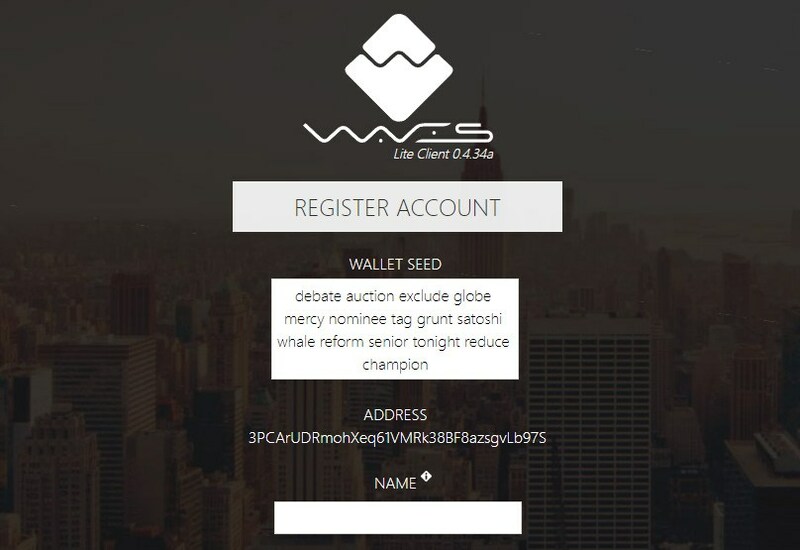 Another way to create your wallet is to visit Waveswallet.io https://waveswallet.io/ and create it there, this is the online wallet which you can access in your browser. When creating your wallet it will give you an address, ask for your name and password and will also give you a wallet seed which consists of a number of different words – ** It is very important that you copy this information down on a piece of paper and store it somewhere safe **, even better to save it as a text file and put in on a thumb drive somewhere safe as this is how you backup your wallet and can recreate it at a later date. To begin staking Waves, you will need to purchase some from an exchange – they are currently available on the following exchanges https://coinmarketcap.com/currencies/waves/#markets . 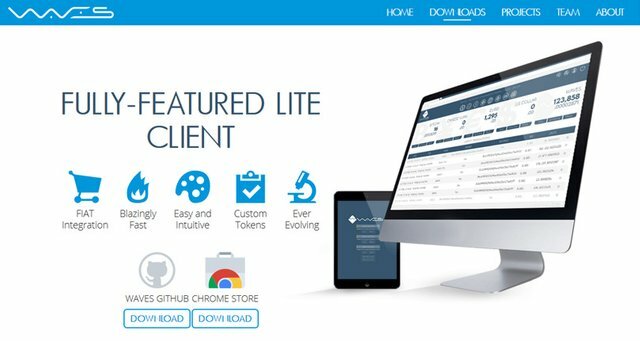 I personally use Bittrex for purchasing Waves, you are also able to buy them directly in the Lite Wallet with USD. If you just want some Waves for free to figure out the wallet and get used to how it all works, you can get some by visiting websites called “Faucets” and entering your Waves address, the Faucet will then send you a small amount for free. Sometimes they also send you some other bonus tokens at random which you can hold in your wallet or sell on the DEX. 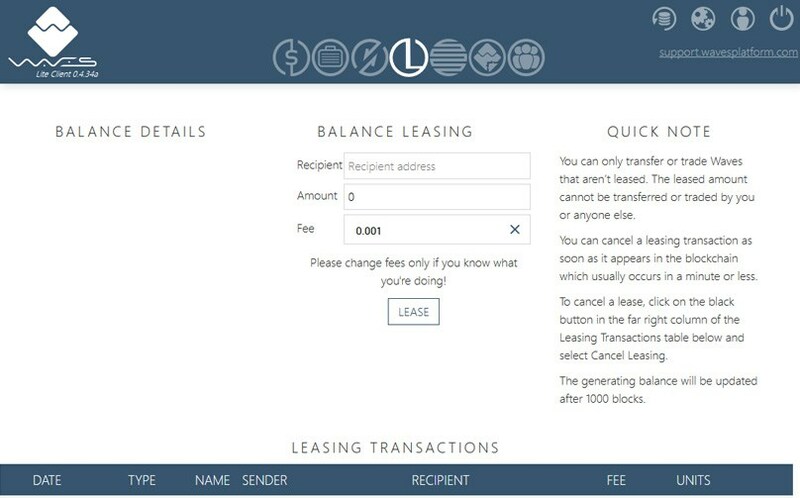 Once you have your Waves and have sent them to your Wallet address, you can begin leasing them. I personally use Waves Go for leasing, they pay out weekly on a friday and send you Waves, Miner Rewards and also an amount of their own Waves Go tokens. To lease your Waves, all you have to do is grab the address from your chosen node and in the Lite Client, click the “L” icon at the top. Then enter the recipient address at the top, enter the amount of Waves to lease and click the “Lease” button. It’s a simple as that, all you have to do now is wait for your rewards to be sent each week. It should be noted that while you are leasing your Waves, they can’t be transferred out of your Wallet so if you wish to move them to sell them etc you will need to cancel the lease first. 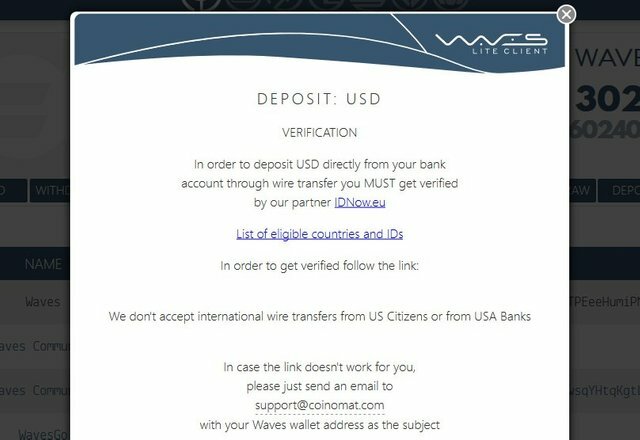 As mentioned, you will receive your Waves rewards each week or month, depending on which pool you use. Another benefit of Waves is that on the 15th of each month, some Waves Community tokens are air-dropped to your wallet – these are free tokens to rewards Waves holders which you can either store in your wallet or sell on the DEX for Waves or any other currency or token. If you follow our complete guide, you should be up and running and leasing your Waves in no time at all. Let us know in the comments if you have any questions.